We are honored to have our article selected as an Editor’s Pick. This article is a great example of how doctoral students can collaborate to transform in-class assignments into scholarly publications. Whitney began the doctoral program. Having been intrigued by the poster as she walked past it countless times, Whitney approached Megan to ask about her findings. Through a series of conversations, they discovered their similar passions and interests regarding the importance of social justice in nursing education. Instead of starting from scratch for her assignment, Whitney received permission from Dr. Walker to build on Megan’s original idea in order to expand and refine it into a manuscript for publication. Whitney took the original paper and added both a historical perspective and a public health lens to the work. After receiving a grade for the assignment from Dr.
Walker, Whitney and Megan continued to collaborate on revisions until it was ready for submission to ANS. This collaboration was an excellent learning experience and reinforced the idea that careful planning can result in class assignments that are readily transformed into manuscripts suitable for publication. Thank you for this most recent call to action regarding integration of social justice concepts in pre-licensure curriculum. 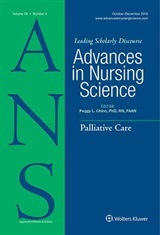 The concept of social justice was further elaborated in the revised 2015 Code of Ethics and discussed in great detail in Marsha Fowler’s updated Guide (2015) – however, I agree with the authors that curricular content needs to be specified and examples provided, perhaps in the upcoming revisions to the AACN Essentials (all three-BSN, MSN, and DNP). In that regard, I would be interested to know how the authors might envision building on the pre-licensure social justice student competencies in DNP or PhD curricula. I am including a link to a simulation exercise focused on recognition of the social determinants of health used in an accelerated BSN program. AACN (Colleges) aslo has a recent webinar on integrating these concepts in the curriculum. I am also a graduate of the Austin PhD program (2002)! great challenge to nursing and nursing educators! Thank you Dr. Robichaux for your emphasis on the Code of Ethics! You pose an interesting question regarding how we can extrapolate student competencies into graduate work. I think we need to consider the role of advanced practice and graduate nurses in addressing social justice within healthcare. From these role identifications, we can being to integrate expectations for practice into accreditation standards for graduate programs. Thank you for sharing the simulation with us. What an innovative way to highlight social justice in a dynamic way!